Which lane should I drive in? Drive in the clearest lane. Avoid passing other vehicles especially if you will have to leave a clear lane and pass by driving through snow. 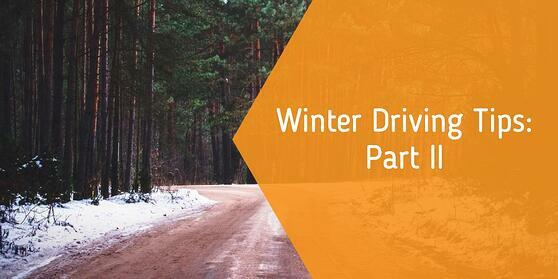 The snow will reduce your traction even if you are driving a hulking four-wheel drive vehicle. The snow you blow around while you are passing will further blind the people you are passing and you will increase the risk of collision for the both of you. How should I handle climbing hills? If you have to climb hills to get to your destination choose ones that have little or no curves to them. You have to carry enough speed up the hill so you won’t have to increase you speed once on the hill. If you lose speed on a hill and have to stop you may spin your tires. Spinning your tires on an upgrade will cause your drive wheels to slide towards the curbside or snow bank. Almost every road is graded slightly to the left or right for water drainage and once your tires start sliding against the pavement you will slide down that slope towards the edge of the road. Front wheel drive vehicles will have their front end swinging towards the edge. Rear wheel drive vehicles will find their back ends sliding towards the edge and four-wheel drive vehicles will find all four tires slipping towards the edge. If you climb a hill and sense that you might get stuck look for somewhere to turn around instead. Descend the hill and try again or find a new route. What about going down a hill? Before you descend a snow covered hill reduce your speed to about 15 mph and put your car, even your automatic transmission, into first gear. This will allow power from your engine to help restrict your speed to between 15 and 25 mph. You should then only have to brake intermittently and you should do so as gently as possible. What should I do if I have to park in the snow? If you get to your destination and you have to park in a snow covered parking lot or driveway create a path for when you leave by driving forward and back to pack down some of the snow you will drive on when you leave. Winter weather brings all kinds of challenges to the road, but by keeping these tips in mind you can minimize your risk should you have to drive. For our newest drivers I would suggest getting some practice with your parents. Go to a local school parking lot with lots of room. Learn what the ABS brakes feel like. Practice controlling a skid or two, but do so safely. Stay away from vehicles and light poles. Take it slow, and if you're ever not comfortable, stop. Do you need more practice driving before you test for your license? Schedule a drive with us today!